West Windsor, N.J.– One of Trenton’s most well-known historical sites is getting a marketing update, thanks to the creative work of Mercer County Community College’s Advanced Advertising Design students under the direction of Professor and Coordinator, Tina LaPlaca. Their capstone project this spring focused on the Old Barracks Museum, which dates to 1758 and served most notably as a barracks for the British and then as a military hospital. Five teams of students created comprehensive marketing campaigns, including original logos, slogans, newsletter designs, web pages, posters, promotional items and more. 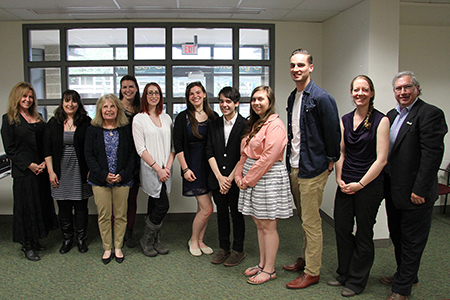 Judges from the Old Barracks commended students for their originality and enthusiasm during presentations in May. Students' winning designs will be utilized in the museum's upcoming season to promote to schools as well as the annual re-enactment of "Battle of Trenton" in December. From left, Old Barracks staff members Nikki Bell, Rebecca Heiliczer, Linda Mathies, and Lauren Ronaghan, the winning student team of Angela Barbush, Autumn Bardachino, Efrain Rosario, Lauren Rostash and Zach Bryson, and Old Barracks staff members Vikki Bell and Executive Director Richard Patterson.